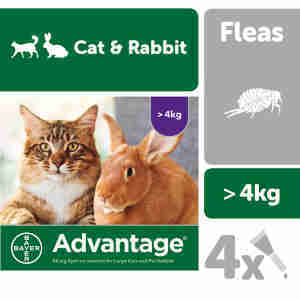 Advantage 80 for Large Cats and Rabbits that weigh 4kg to 10kg, can be used for both the treatment and prevention of flea infestations on cats, and the treatment of fleas on rabbits. Advantage 80 is ideal for cats with skin conditions who require bathing as it works even when it's wet, meaning there is no need for reapplication. One treatment prevents further flea infestation for up to three to four weeks on cats and up to one week on pet rabbits. The treatment should be repeated after 4 weeks. To administer, part the coat between the shoulder blades until the skin is visible. Place the tip of the spot-on pipette on the skin and squeeze gently to empty its contents onto the skin, preferably at two spots, one at the base of the skull and a second 2-3cm's further back. Each tube contains 0.8 ml (80 mg imidacloprid). The product also contains benzyl alcohol and butylhydroxytoluene (E321) as an antioxidant. Do not use on pet rabbits less than 10 weeks of age. It is recommended that your home is also treated for fleas to prevent the likelihood of reinfestation. Does the job! Cheaper to buy this product online than at the vets. Prefer this treatment for my cats over frontline. Price is good As well. I always rely on Advantage to do the job. Great product,great results at a fair price. Highly recommended. Always use this product...it does what it says on the tin.....arrives in great time.